Hunting is one of the most valuable hobbies to have and needs to be passed on to the next generation. The benefits are endless when it comes to sharing this amazing sport with your children. It’s important for any child to get unplugged and spend time outside, and what better way than hunting! This activity can give a child the ultimate outdoor experience and encourage a true appreciation for the nature and wilderness around them. There are many health benefits of spending time outdoors, like exercising out in the fresh air. Hunting is known to reduce stress which creates a good environment for your kid to grow physically and mentally. Hunting is more than just a sport. It is a way to understand the world and the way of life. Your children will learn about the food cycle as well as the balance of animals in a given area. Hunting promotes conservation in general by protecting the land and maintaining the balance. By teaching your children how to hunt, it will provide you with another opportunity to bond more closely with them. 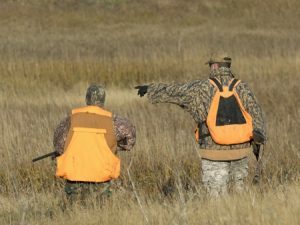 Out on a hunt, you can build memories and connect more with them while also watching them develop their own self-confidence and self-reliance. The most important part of youth hunting is understanding gun safety. This knowledge will ensure the safety of your children and the people they are hunting with. It starts with understanding how to position a gun to aim and shoot at a target properly, but to also carry it securely throughout the hunt. As your child learns how to safely transition between the two, they will become more confident in their hunting skills. Gun safety also encompasses learning about the mechanics of a firearm: What is the job of each individual part, how to load and unload ammunition, and most importantly, how to turn the safety on and off. With all of these benefits hunting has to offer, it may be time to plan a trip for you and your kids in the “Gem of the Hill Country!” Call us at 325-347-2613 to book your guided hunt at Schmidt Double T Ranches today!